There are some reports of their susceptibility to the downy mildew pathogen Plasmopara obducens, but it has not been reported on these species in Ohio. Woodland walkers are sure to recognize these other impatiens, though you may know them by other names, such as jewelweed or touch-me-nots. Their given Latin names are: Impatiens capensis, with orange flowers and Impatiens pallida, with pale yellow flowers. The first sign of them in spring are their button-like leaves, reminiscent of the shapes of radish seedlings. They grow quickly into spreading mounds of almost shrub-sized colonies though they are decidedly herbaceous. Their leaves are hydropobic and glisten with coalesced droplets of water – jewels you might say. Enjoy these wild impatiens. As with their horticultural cousins, they are in the Balsaminaceae. Also like their bedding impatiens cousins, they wilt during the heat of the day, but pop back up when it cools. In the forest you can actually see wilting plants in the sun right next to un-wilted plants in the shade. Jewelweeds are reputed to only grow near poison ivy, which is clearly not true, but also are reported to help limit poison ivy effects if their juice is rubbed on exposed skin. 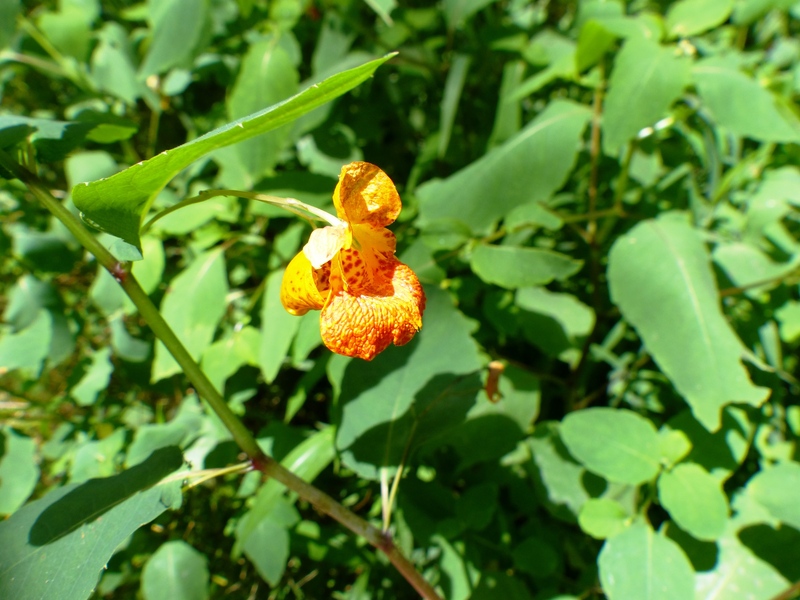 A 2012 study in the Journal of Ethnopharmocology, using Impatiens capensis, concluded that mashed up jewelweed rubbed on the skin helped reduce dermatitis from poison ivy, but not as effectively as soaps, though in the woods jewelweed may be more available in the moment.